In 1871 Henry Grimm was ahead of the game. He purchased the northwest corner lot at 100th Street and Broadway—then called the Boulevard—and erected a building. 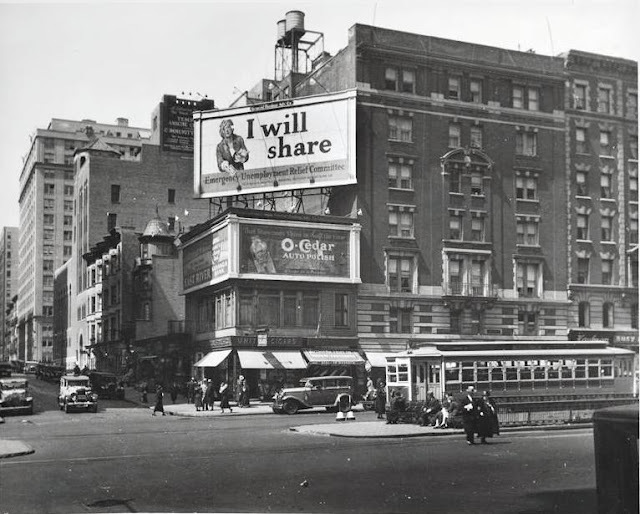 Within a decade the streets of the Upper West Side would begin being paved, the elevated train would arrive and sewers would be extended this far north and west. But for now Grimm was an urban pioneer. Four blocks to the east the great Central Park was nearly completed and already daring citizens were constructing homes and small businesses in the neighborhood. They would need groceries. Henry Grimm’s trim frame building was completed in 1871 and at three full stories was rather ambitious. The wooden structure borrowed from the more sophisticated brick and stone buildings further south in its Italianate architecture. Like those proper homes and businesses, it had a deep cornice supported by carved scrolled brackets and wooden window hoods that mimicked their stone counterparts in town. Grimm’s building housed his grocery on the street level and living space for at least two families upstairs—his own and a renter’s. Unfortunately for the enterprising Grimm, his gamble may have indeed been to soon for he lost his business and home to foreclosure just five years later. By 1889 when the Real Estate Record & Builders’ Guide assessed the condition of the neighborhood the grocery store had given way to a saloon. The Guide pointed out ongoing improvements—the southeast corner of Broadway and 100th Street was being excavated and “some 20,000 to 30,000 brick on ground ready for building. Three lots adjoining vacant.” Grimm’s former building was still the only structure on the west side of the block and the publication described it as “The Boulevard House, a three-story frame liquor saloon with apartments.” Although 100th Street was paved, 101st remained a dirt road. While all this was going on in the Upper West Side, German immigrant Peter Doelger was busy making beer. Born in Bavaria on March 3, 1832, he had learned the brewery business from his father who ran a “small but prosperous brewery, in which he made a dark brown beer, known as ‘yellow’ beer, whose fame spread beyond the province,” as recorded in the American Brewers’ Review decades later. All six of the Doelger children learned to make beer in their father’s brewery. Peter Doelger traveled to New York in 1850. The 18-year old had big dreams and no money. After working in New York for a year, he traveled to Savannah with the idea of starting a business. But Savannah was a disappointment and he returned to New York where, with his brother, he started a brewery on Third Street between Avenues A. and B. This time he succeeded. Nine years after setting foot on American soil the young man was ready to go it on his own. He bought four lots on Avenue A and started an independent brewery. Nearly single-handedly Doelger introduced New Yorkers to beer—and they liked it. As Doelger’s fortunes grew, he bought up property and opened his own saloons. Although liquor could be gotten in a Doelger saloon, like all other drinking places, it was his beer that lured his customers in the door. By 1894 the Upper West Side was booming and the many rows of houses were supplemented by new apartment buildings. The rapidly expanding population created the potential for another successful outlet for Doelger’s brew. That year Peter Doelger purchased the wooden Grimm building. A restaurant served families (with a separate entrance to the rear) and gentlemen partaking of the foamy libation would have lined the bar in the front. Upstairs, two families leased the apartments. 38-year old Irish immigrant John Conroy, his wife Nora and their four children were here, as were Mr. and Mrs. Walter Hausford and their two children. The 31-year old Hausford hailed from Scotland and worked as a watchmaker. In 1912 Doelger took a gamble and opted for electric trucks to deliver his beer. “Peter Doelger has sold 169 horses since buying fifty-four electric trucks and has only five horses left,” reported the Electrical Review. It would be one of his last daring moves. On December 15, 1912 Doelger died at the age of 80. Having come to New York nearly penniless, he died leaving an estate of more than $7 million, including a mansion at No. 280 Riverside Drive just around the block from the saloon on Broadway. The American Brewers’ Review credited him with making New York a state of beer drinkers. “This State, in which Peter Doelger lived and died, is the most majestic maker and consumer of beer in the Union,” it said. Prohibition put an end to the saloon business at No. 2641 Broadway. In 1920 the former bar was converted and the entire first floor leased to “Maison Antoinette,” purveyors of gowns and millinery. The masculine haunt filled for more than two decades with cigar smoke and beer drinkers now displayed feminine finery. Sometime around the Great Depression the second story was heavily altered. The clapboards were removed and expansive show windows installed. Now all that remained of Henry Grimm’s prim wooden grocery-house was the third floor. But even that was disguised by huge, all-encompassing billboards constructed to veil both sides. United Cigars is in the corner store in 1932. Despite the well-dressed pedestrians, the Great Depression is evident in the billboard for the Emergency Unemployment Relief Committee above No. 2641--photograph from the collection of the Museum of the City of New York. A 1953 conversion resulted in retail stores along the street level and a “tea room and restaurant” on the second story. Above were a “TV rehearsal studio and offices and showrooms” according to the Department of Buildings records. That studio was home to the Living Theatre which would remain here through most of the decade. By 1991 the venerable old building still survived—somehow—but was in serious disrepair. Although attempts had been made to have the structure designated a landmark, its severe alterations were a problem. That year owner Samuel Rosenblatt leased the building to two diner operators Hilos Fotios and Fanis Tsiamtsiouris. The building had already been nominated for landmark status and the restaurateurs were concerned that the Landmarks Preservation Commission would act on the property. Although Hilos Fotios promised, in effect, to restore the building, he also bristled at questions regarding its preservation. “I have my permits. I can go tomorrow to take everything down. Whatever I have to do to protect my business, I’m going to do,” The New York Times quoted him as saying. As it turned out, the men spent much of their money on strengthening the old building—patching the roof and shoring up the floors with steel beams and masonry. More than a decade later the Metro Diner still operates a ground level. Where women shoppers once paused in the second floor tearoom, they now have their nails and hair done. I always loved coming up Broadway on the bus and seeing the Grimm Building. It meant I was back in my neighborhood (I lived at 105 and WEA) and it reminded me of how fast things change and how we can preserve them when we want to. Thanks for this post! I saw the Beastie Boys Story last night in Brooklyn. They stated that their careers began in this building in the late 70's when the store front was a Cuban Chinese restaurant. Their frined lived in the apartment above where they began making music.